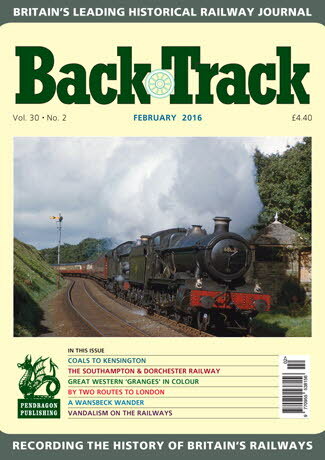 Railway Magazine | BackTrack February 2016 journal from Pendragon Publishing. Birmingham South Suburban - 1970s colour photos on the Midland line by Michael Mensing. Coals to Kensington - Michael J. Smith looks at steam-hauled freight on the District Line. By Two Routes to London - A. J. Mullay describes the junction of the East Coast Main Line and Waverley Route at Portobello, outside Edinburgh. Wheldale Steam Renaissance - Tom Heavyside records a late development in colliery steam working in Yorkshire in 1981. It seemed like a Good Idea at the time - Part Four - Miles Macnair concludes his series by looking at Compressed Air Locomotives in the 20th Century. The Cold War - Part Two - Dr. Malcolm Timperley concludes his review of how railways fared in the winter of 1940. The Great Western 'Granges' - four colour pages of this mixed traffic class during the 1950s/60s. A Wansbeck Wander - Glen Kilday rides this Northumberland branch goods. Out and about in the North West - three pages of colour in Lancashire, Cheshire and Derbyshire by Brian Magilton. Vandalism on the railways - A. F. Nisbet shows that this is an old problem! The Southampton & Dorchester Railway - a history of the old route known as 'Castleman's Corkscrew' by Michael S. Elton. Llandudno Junction - archive photos of this important railway location and its branch to the seaside resort terminus.